The 24 short films that make up the collection – each four and a half minutes long – supposedly takes a single frame of imagery and imagines the minutes before, after or around the moment. Kiarostami began this experimentation with notable paintings, as he begins the film with a motion aspect of a Pieter Bruegel masterwork. In the rest of the film, the next 23 “frames,” he used his own photography, and breathed life into those still portraits. This includes such zen notions of nature being observed through windows, or errant animals in places where they shouldn’t be. Each frame story is fascinating, creating a thesis between what is projected versus what is real, and becomes a zen calming (with exceptions) force of energy. “24 Frames” is part of the Gene Siskel Film Center’s 28th Iran Festival of Films (click link below). In Frame 1, the masterwork of Pieter Bruegel, “The Hunters in the Snow” (1565) slowly comes to life, mostly through following Kiarostomi’s pungent sound design, which follows through on the rest of the frames. 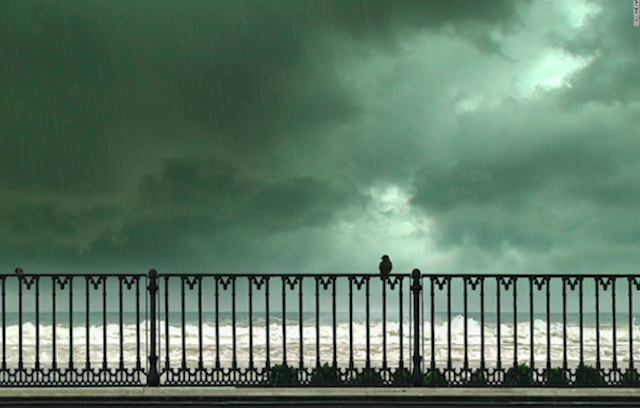 The effects of “reality” – animal noises, wind, the rushing ocean – are all up front, and in other frames the use of opera and musical stings comment on the unfolding mini-stories. If there are “themes” of exposition in the frames, it would mostly involve trees, oceans, windows, weather, starkness, linear framing and nature. There are a few frames where people intrude, but it’s always with a modernistic destruction or satire – Frame 15 is a goof on tourists in Paris. For the most part, this is a window into how a filmmaker observes, and communicates. What nature does Kiarostomi love? Birds, cows and trees are the most observed subjects, especially the randomness of birds. In Frame 16, a view of the ocean through a crumbling edifice is enhanced by ducks on either side of a change link fence. The ducks in the foreground and background encounter each other in an amusing, charming and uneasy meeting. Human beings are the least of the subjects, most prominent in the aforementioned Paris Frame 15. A single line of European tourists, perhaps from another time, stand frozen looking at the Eiffel Tower. 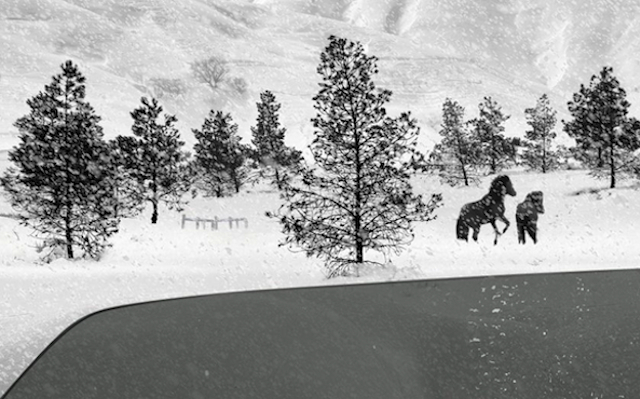 Kiarostomi then places various characters in the foreground, including an Edith Piaf-like singer strumming a guitar. This seems like a riff on the reality of Paris versus what the tourists want to see, and ends up with the E Tower lights pinging like a casino. There are predators in some of the themes. In one of the through-the-window bird sequences (Frame 18), a serene winter scene of birds frolicking is interrupted by a pouncing cat. Humans are also intruders. There are hunters in a deer scenario (Frame 5) and a remarkable bird view that ends up being a sliver of highway (Frame 14). My particular favorite was Frame 22, a view of a dog barking at (yes) birds and a wind flag on the ocean front. The pooch’s determination is interrupted through a random (?) event, and it is unintentional comedy. I put a question mark behind the word “random” above because the filmmaker Abbas Kiarostomi reveled in defining cinema within the illusion of its strange 24 frame per second motion, and often his films manipulated the narrative control that film affords. His voice will be missed, but this last cornucopian rendering of truth and illusion is the artist’s final gift. ”24 Frames,” Part of the 28th Iran Festival of Films, runs through February 15th, 2018 at the Gene Siskel Film Center, 164 North State Street in Chicago. For other screenings, see local listings for theaters and show times. For general Gene Siskel Film information and schedules, click here.